Thirteen fun-loving felines fill the day while their human is gone with all the activities an imaginative pet owner might hope for. A houseful of unnamed cats takes advantage of their time away from their owner’s gaze to do everything from bathtub diving to cooking to knitting and modeling the latest in yarn apparel. It’s an entire book of what amounts to (admittedly) adorable cat poses and cat situations featuring the roundest, fluffiest varieties of them in many colors and textures. The text, then, ends up feeling perfunctory (“Snack time!”) when it’s not completely unnecessary—the power of the artwork to communicate is at times stunning. A two-page spread showing a close-up of a multicolored cat’s pleased face is brilliantly painted, as are scenes featuring all the cats together playing music or putting together an art exhibit. 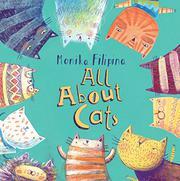 Though they all seem to come from a planet where every kitten grows up to be a cat with a giant belly and kind eyes, author/illustrator Filipina makes each of the 13 visually distinctive even if it seems like a missed opportunity not to have also given them more individualized personalities. There are many worse ways to spend time than gazing agog at the way the artist has turned such a routine idea for a picture book into a tour de force of feline-themed eye candy.